There are three main types of microwaves which include countertop, over-the-range, and built-in models. For this article we are only going to focus on countertop microwaves. These appliances plug into a standard electrical outlet and do not require any special installation. They typically range in capacity from 0.5 cubic feet to 2.2 cubic feet. You should know the size of plates or pans you plan on using to cook or reheat your food and make sure that the size of microwave you buy will accommodate them. The power of a microwave is measured in watts. Compact or cheaper units will generally be around 800 watts or less with larger microwave ovens around 1000-1200 watts or even more. More power, or watts, usually means more heat which translates into faster cooking times and better overall performance. Maybe the most important factor in making a good microwave is how evenly it heats your food. In addition to that we used power, capacity, price, convenience features, and other customer reviews to come up with our ratings. Below we review our top 10 best microwaves. 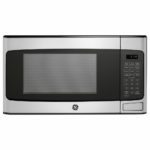 At the bottom of these microwave oven reviews we also provide a comparison chart to easily compare one model versus another. If you need more information before purchasing a microwave then see our microwave buying guide. We selected the $243 Panasonic NN-SD775S as the best microwave. This 1.6 cubic feet capacity model was also picked as a Best Buy and received the highest score by the leading consumer magazine. In fact that company ran a survey on the owner satisfaction of microwave ovens over the last 10 years, and found that 9 out of 10 Panasonic microwave owners were extremely likely to recommend their countertop microwave to friends and family. That is much more than any other brand. The NN-SD775S has 1250 watts of power and Cyclonic wave technology which cooks food more evenly. Controls include 20 preset sensor cook menu items, Inverter Turbo defrost, delay start and timer, more/less control, child safety lock, quick 30 Sec and popcorn button with 3 cooking levels. We think the Panasonic NN-SD775S is outstanding, but it is on the expensive side. Cheaper microwave ovens are available that perform nearly as good. Next is the Panasonic NN-SN966S which sells for about $210. This thing has the largest capacity of any microwave on our list at 2.2 cubic feet and has a 16.5 inch turntable. It also has 1250 watts of power. The NN-SN966S does not have the cyclonic wave technology like the NN-SD775S, but we think it performs just as well in heating evenness and in defrosting. The built-in automatic Genius Sensor adjusts power and times based on different foods. Other features include 14 preset menu items, quick-minute timer, delay start, Keep Warm feature, and child safety lock. 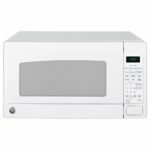 You might also be interested in the Panasonic NN-SD945S which is essentially the same microwave, but has a different control panel and costs a few dollars more. The $179 LG NeoChef LMC1275SB rates as the best microwave under $200. It received a Best Buy recommendation from the leading consumer magazine for mid-sized countertop microwaves. While it doesn’t have sensor cooking, it does have LG’s Smart Inverter which cooks food evenly and doesn’t leave you with cold centers or burnt edges. We think the LMC1275SB performs as well as any other top model, however the minimalist style of the control panel leaves us wanting more. The controls aren’t as intuitive and takes a bit of getting used to, although once you know what you’re doing you might prefer this setup. It has 1.2 cubic feet of space, 1200 watts of power, 7 auto-cook options and 10 power levels. 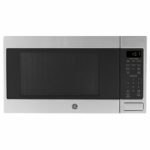 If you want basically the same microwave only larger, then you could consider the LG NeoChef LMC1575 which has a capacity of 1.5 cu ft. It is available in white and stainless steel. Another quality large microwave oven is the $219 GE JES2051DNWW. It has 2 cubic feet of capacity and 1200 watts of power. In testing it had among the best automatic sensors we have seen out of all the microwaves which left food evenly cooked, but not burnt. The keypad is a bit cramped with lots of buttons and it is not the most intuitive to use, but once you get the hang of it it’s not that bad. There are plenty of one-touch options which is nice. The GE JES2051DNWW is available in white, black, or stainless. However the price for black or white is much cheaper than the stainless option which costs $50 more. 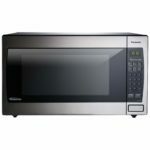 The Toshiba EM131A5C-BS microwave oven provides maybe the best value for the price at just $120. That is probably why it is among the best selling microwaves on Amazon. It cooks food very evenly and efficiently. The EM131A5C-BS has 1100 watts of power and 1.2 cubic feet of capacity with a 12.4 inch turntable. In addition to sensor cooking and standard preset buttons for things like popcorn, potatoes, or pizza, it also has a large amount of express controls for things like cooking bacon, softening butter, or defrosting frozen muffins. You can also mute the buzzer if you like. 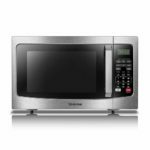 Overall the Toshiba EM131A5C-BS is an excellent microwave oven for the price. 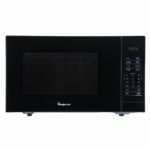 The best small microwave is the Toshiba EM925A5A-SS which sells for around $89 which also makes it the best microwave under $100. This model has just 0.9 cubic feet of capacity and 900 watts of power, but it really performs almost flawlessly just like the larger Toshiba EM131A5C-BS. However, it can take a bit longer to cook some foods than some more powerful units can. The controls on the EM925A5A-SS are simple to use, although it does not have quite as many preset options plus there is no sensor cooking. A 10.6 inch diameter turntable is inside, so really large dishes might not fit, but standard plates will. 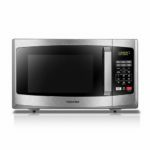 Overall the Toshiba EM925A5A-SS might just be the best countertop microwave for small kitchens. 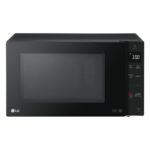 One of the best selling and highest rated microwaves at the Home Depot is the $188 LG NeoChef LMC2075ST. It is the cheapest of the large-capacity models on this list with its 2 cubic feet of space. This thing uses LG’s Smart Inverter as well as sensor cooking to get even cooking and defrosting with great results. The LMC2075ST doesn’t have a lot of preset cooking options for different foods, just one for popcorn. Instead it relies on the Sensor Cook option, which while good, doesn’t always result in what you want. Other features include 1200 watts of power, EasyClean anti-bacterial coating, and smooth touch controls which wipe clean. 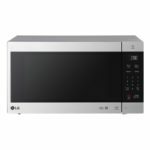 If you are searching for a large capacity microwave, but don’t want to spend over $200 then the LG NeoChef LMC2075ST is for you. The GE JES1657SMSS, which sells for around $165, is a decent choice for a medium sized microwave. The overall cooking ability is pretty good, while the two main negatives being that it doesn’t defrost meat very well and it lacks the ability to silence beeping. The JES1657SMSS has 1.6 cubic feet of capacity, 1150 watts of power, sensor cooking, and some one-touch controls. It is available in stainless, black stainless, black, and white. Another good option under $100 is the GE JES1145SHSS which costs just $99. We found it didn’t quite perform as well as some of the more expensive microwaves, but not really bad either. Again defrosting meat is where it struggled the most. Available in stainless, white, or black the JES1145SHSS has 1.1 cubic feet of capacity and 950 watts of power. It has 10 power levels and several one-touch controls, but it does not have sensor cooking. Overall the GE JES1145SHSS would make a good choice for a small microwave. If you are looking for a cheap microwave may we suggest the $70 Magic Chef HMM1110B. It is the cheapest microwave on our list and has 1.1 cubic feet of capacity and 1000 watts of power. Overall it performs decently, but doesn’t really stand out in anything it does well. The Magic Chef HMM1110B is for anyone who wants the best cheap microwave they can get. However, for around $20 more you can step up to the Toshiba EM925A5A-SS which is a better performing microwave. Power / Watts – The wattage relates to how much heat an appliance puts out. The more watts the faster your food will cook. Budget models will have about 600-850 watts. Medium sized versions usually have between 900 and 1100. Top of the line units usually have 1100 watts or more. Capacity – The capacity is measured in cubic feet. Full-size microwaves are usually 1.5 cu. ft. and larger and are recommended for large dishes like lasagna. Medium sized models are around 1.2 cu. ft. Compact units may be as small as .5 cu. ft. and have less cooking power, but take up much less counter space. Turntable – While most units are not good at heating food evenly, a model with a turntable rotates the food to provide more even cooking. You should know that turntables often lower the stated capacity of a microwave because rectangular or square pans or platters that are too large will not rotate on the turntable. We highly recommend getting a model with a turntable. Sensors – They adjust the power levels and cooking time for various food items by monitoring the humidity in a microwave to prevent overcooking. Many new models, other than budget units, come with a sensor as standard equipment. Inverter – When you operate a normal microwave at reduced power, it typically alternates between states of full power and no power. Inverter technology allows the appliance to use a small percentage of its power over the entire time to cook or defrost food more evenly. This is not a standard feature and not one you absolutely must have, but it does come in handy especially when defrosting or softening foods like butter or ice cream. Convection Oven – This uses a fan to circulate the heated air evenly around the unit to shorten cooking. With this feature it is almost like having a second oven to cook in, but experts say the results will not be the same as a regular convection oven. At an additional cost of about $100, this feature is an expensive option and not one that is necessary for ordinary users. Convenience Features / Buttons – Many units come with shortcut buttons for foods like popcorn, baked potatoes, vegetables, and many more that automatically cook your food for you. Look for a model with shortcuts you would actually use. You will find models may use either a keypad or dial for setting cooking time and power levels. Some other buttons you mind find helpful include a 30 second or 1 minute key, defrost, and reheat.